So its mother’s day, what do you make? The usual Sunday roast or something a little more special? 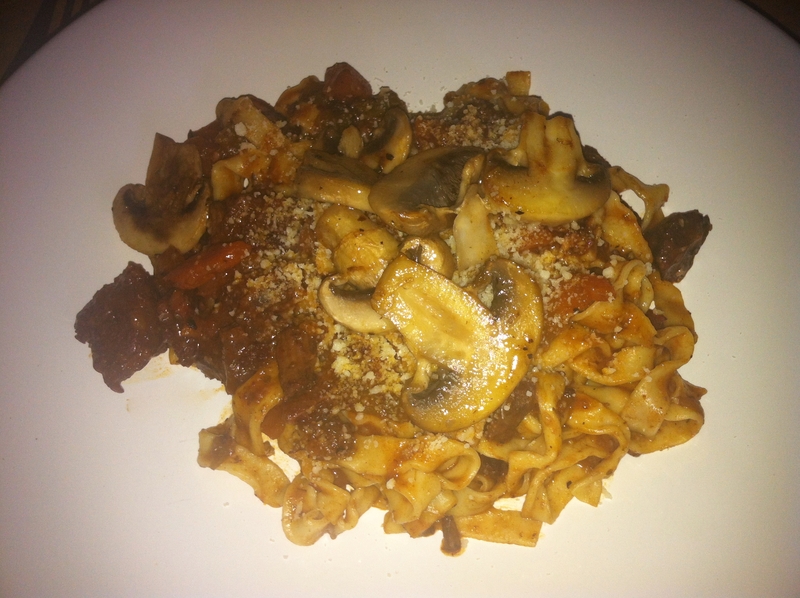 This year I opted to make a ragu adapted from a recipe I had watched on TV. This recipe used wild boar, however I realised I should’ve ordered this from the local butchers in advance so I had to think on my feet! I have always wanted to cook with shin of beef after having it at several restaurants and the added bonus of it being one of the cheapest cuts of beef made it even more appealing! This picture does not give the dish any justice. I am definitely going to have on work on my camera skills. However as the dish turned out to be so tasty, and yes I will definitely be making it again, I felt I had to make this one of my own first recipe’s in this section of the blog. The slow cooking of this dish allows the flavours to develop and tenderise the beef. It also means that when it is in the oven you can relax and it can be made in advance. The addition of the homemade pasta gives it the complete divine factor. The truth is it was actually very easy to make but produces a mouth-watering, impressive family meal. Preheat the oven to 150c/330F/gas 2. Heat a tablespoon olive oil in a heavy based pan or casserole set over a medium heat. Add a chopped onion, 2 diced carrots, 2 garlic cloves chopped, 2 celery chopped and a bay leave to the pan. Season with salt and pepper. Lightly coat 750grams diced shin of beef with a little seasoned flour. Add some olive oil to a frying pan and set over a high heat, brown the meat all over. When the vegetables have softened, add 150grams cubed pancetta (or bacon lardons), a few teaspoons dried oregano and the rind of an orange. Cook for a further 5minutes until the pancetta has browned. Add the beef to the vegetables along with 2 tablespoons of tomato puree. Pour 375ml red wine (one that you enjoy so you can enjoy a glass whilst cooking!) into the frying pan that you cooked the beef in and scrape any residue left at the bottom of the pan. Pour the warm wine and 200mls water into the ragu, and bring to a simmer. When simmering put the lid on and place in the oven for roughly 2.5 hours. Stir occasionally to prevent the meat drying out. You want the meat to flake into pieces so it will melt in your mouth. For the pasta, put 300grams zero-zero flour into a large bowl. Make a well in the middle of the flour and sprinkle over 1 teaspoon salt. Add 3 eggs to the centre and with a fork whisk the eggs then gradually incorporate the flour into the eggs. When you find it too hard to whisk, use your hands to combine and knead to form a soft, smooth dough (should take about 5minutes). Cover in cling film and leave to rest for 5-10 minutes. After the pasta has rested, cut into 2 and put it through a pasta machine, starting at the widest setting and working down until you have passed it through the thinnest setting. You can then put it through the tagliatelle cutter or cut into strips by hand. Sprinkle over semolina flour to prevent them sticking together. Repeat with the other half of the pasta. When the ragu is tender, taste to ensure the seasoning is to your liking. Bring a large pot of salted water to the boil, add the pasta and cook for 3 minutes (you can drizzle over a little olive oil if not using immediately). Mix the pasta into the ragu pot. Serve with fried mushrooms on top and parmesan.